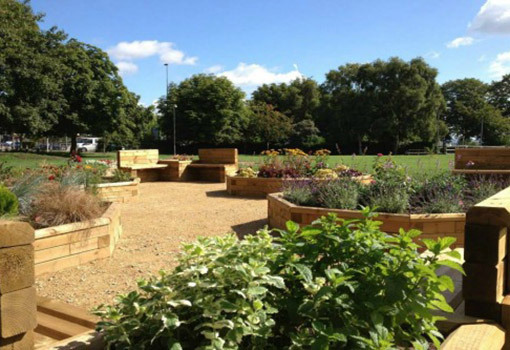 The Community Garden project commenced in 2012 with a simple idea of creating a space and focal point for the community to come together to not only enjoy relaxing and playing in but also be part of its creation. Now five years on the garden has become much loved part of the community and has won a number of awards from national bodies including the RHS who described it as the best garden of its type and a benchmark for others. The Chairman’s report below details the progress so far and aspirations for the future. The first topic of my report this year can only be the sad passing of our founder, inspirational leader and mentor Bill Moore. Bill is the reason we are all here today and why Filton now has a fantastic asset of an RHS award winning garden. It was Bill’s vision and determination in the face of many obstacles which brought the garden to life and will be a lasting tribute to his memory, R.I.P Bill. Once again we have defied all odds and improved the garden this year, we always think we have finished but then someone has an idea and with little pomp and ceremony we make that idea come to life. In March we planted an orchard of 9 trees with different varieties of apples, pears and cherries, which was good, but what made it special was that it was the children from our local primary schools, who did the planting. Seeing the children digging, planting, staking and labelling the trees with such joy on their faces was so rewarding, these children are the future and maybe one or two of them will one day become members of our group and take our work forward. It is always sad when a tree reaches the end of its’ life and has to be felled, what if you could give it a new life, which is exactly what we did with a cherry tree in the woodland area. When Neil Palmer. the Council’s Maintenance Services Manager suggested to me that we could commission a woodcarver to make a feature of it I was very enthusiastic at the prospect as were the Committee. Whilst expensive and perhaps a luxury item with the financial help of the Town Council we asked Andy O Neil to give us some ideas of what he could do. Settling on an owl at the top of the tree and hedgehog at the bottom Andy went on to produce something which in our wildest of dreams we never thought was achievable, what an asset to the garden, it must be the most photographed object in the whole of Filton. The addition of the fairy door at the bottom has certainly gone down well with the local children. The garden is now four years old and you can see how it is maturing and establishing, shrubs are growing along the long and dentist borders and gradually enclosing the garden. The Spring bulbs are multiplying giving a fantastic show as are the roses which are now in their second year. The planting in the rockery, herbaceous border and raised beds continues to flourish giving colour throughout the year supplemented by the spring and summer bedding which never fails to impress. This year we also had the first year of the bee conservation area which certainly proved very popular with the bees and other insects and therefore achieved what we set out to do. It was fantastic that the RHS once again gave us their highest award of outstanding for the fourth consecutive year. Ian Murphy judged us again this year and three years after he first came he was amazed at the progress we had made, I cannot stress high enough what an accolade it is to be held in such esteem by the RHS. In the past few months our attention has been diverted by the potential land grab of the garden and other Filton Town Council amenities by South Gloucestershire Council. It is fantastic how the community came together to take the fight to South Gloucestershire Council we have now laid a marker in the sand and South Gloucestershire Council now know that they have a fight on their hands. Well done to Helen for spotting the consultation, if she hadn’t we would be none the wiser and would have a struggle in the future if the land grab comes to fruition, we are now on notice and prepared. It remains to say well done to everyone for all of their hard work throughout the year and special thanks to Helen for her work as Secretary. Look out for details of events in the garden on this page and on the garden noticeboard. Come Along and Enjoy the Garden!! !